Many years ago, in another time and another life, we met an 8-year old girl, the only child of a good friend and co-worker. She was a bit shy, but it was a Christmas party and when Santa showed up with gifts, she quickly became animated and joined with the other kids to enjoy the evening. Over the years, her Dad showed us sports photos of her in high school, told us that she was attending university, proudly displayed her wedding photos and later we learned she’d gotten her Masters Degree. When visiting this same old friend recently, Leeann and her husband, Chris, showed up. She’s not a shy, little girl any more, but rather an articulate, witty, delightful young woman who graciously consented to do a blog for us. My, how the years have passed! Thanks, Leeann! What do you think of when you hear “Delaware”? Most associate the state of Delaware with the mind-numbing drive on Interstate 95, a drive which takes approximately 20 minutes from one state line to the other. Leeann and husband, Chris, on the picturesque Lewes waterfront. 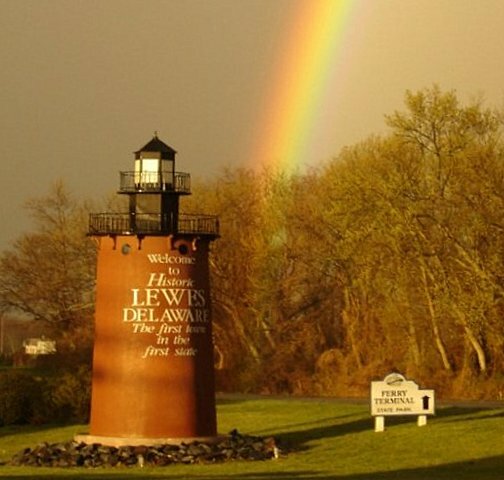 One such place is Lewes (pronounced lou-es), a small city located at the bottom southeast corner of the state where the Delaware Bay meets the Atlantic Ocean. The town of 2,500 is a short drive to the more well-known Rehoboth Beach. Modern-day Lewes is known for superb beach cuisine, as well as pristine, family-friendly beaches. But did you know, it was one of the first European settlements? The Zwaanendael Museum commemorates Delaware’s first European colony established in 1631 and celebrates its importance to the area’s maritime and military history. More recently, due to its strategic position, Lewes became an important coastal defense site during World War II. At the edge of Lewes, lies Cape Henlopen State Park which houses Fort Miles. Built in 1941, the fort was equipped with heavy artillery in order to defend its position on the Delaware Bay and protect the upriver trading hubs of Wilmington and Philadelphia. Today, the Fort Miles Museum and historical area is a comprehensive World War II museum and home to rich historical sites including a variety of military batteries, six remaining World War II barracks, and the Fort Miles artillery park. One of the three guns salvaged from the USS Missouri on display at Fort Miles historical site. Fort Miles is also home to a very large piece of history—one of the three guns salvaged from the USS Missouri, where the official Japanese surrender took place, marking the end of World War II. The 16-inch gun is similar to the ones that had previously existed at Fort Miles, and is now the crowning jewel in the Fort’s artillery park. Cape Henlopen State Park and Lewes are an easy drive from 95 on the historic U.S. Highway 1, which starts in Maine and works its way down to Miami. It’s the perfect low-key beach, that not only provides breathtaking vistas, but is also home to important historical and cultural sites that will take you on a maritime adventure. If you’re extra adventurous and have time to spare, the Cape May-Lewes Ferry that connects New Jersey and Delaware is a fun, picturesque day-trip for all. Leeann Wallett is the Program Officer, Communications and Marketing for the Delaware Division of the Arts, a branch of the Delaware Department of State, dedicated to cultivating and supporting the arts to enhance the quality of life for all Delawareans. In her role, she manages communication, marketing and advertising strategies for the Division to promote Delaware-based arts and cultural activities over multiple channels—owned, paid and earned. She has worked in marketing and communications for over a decade supporting organizations such as the National Constitution Center and National Geographic Museum, as well as a bilingual charter school and a private commercial real estate firm. Leeann remains active in the community, serving as an Executive Board Member for the InWilmington marketing campaign and Communications Committee member for Fresh Start Scholarship Foundation, and working as a freelance writer. She holds a Master's degree from Southern Methodist University/HEC Montréal in International Arts Management and a Bachelor's degree from American University in Foreign Language (Spanish) & Communications Media.